I cannot believe that we have only managed to set three races off this whole season so far, due to a lack of wind, and one of those barely qualified as a race, more of a drift really. Andreas Trukenbrodt wanted to use his boat this time so we set off, without radar as his machine was in the shop. Boy it was scarey out there, especially when one is used to having the equipment to hand. It really showed how much we rely on this stuff. 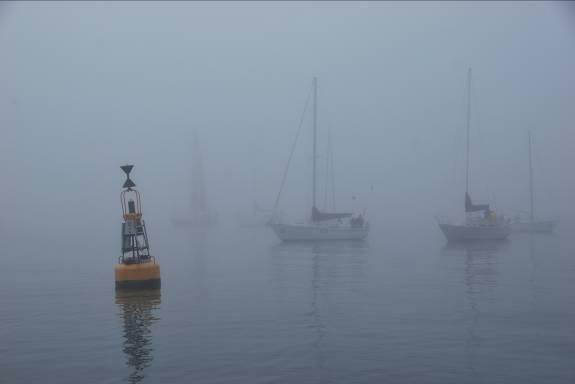 Trying to steer a course into a “pea souper” is very difficult as you have no references to steer by. Your eyes are sticking out on stalks as you peer into the gloom and suddenly you realize you are doing a circle. Luckily we did have a spare chart plotter on a small computer below, so we did know what direction to go in once we realized that we were not checking instruments, like the compass!! We had the VHF tuned to Traffic on channel 12 so we knew if a big ship was coming at us too. We rotated near Brockton Point for a while wondering if anybody would bother to come out, but soon Cora Lee came up behind us and Avalon shot by and headed out. He probably thought he would be the only one to make the start line, so would win the race, what with his radar and so on, but no, it was not to be. We soon headed for the Lions Gate bridge ourselves, which we could not see at all until we were literally right beneath it. This fog was really thick. We steered for the QC buoy to see if anyone else would turn up, and personally I found it amazing that so few people have radar. But then these are racing boats, so why would they, you ask? 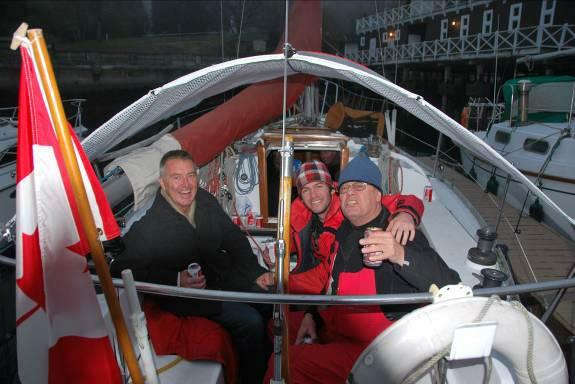 Well, there are other races such as the Southern Straights, and even the Swiftsure that have overnight legs and when radar could make or break your race. Even the 50′ Tiger Lily didn’t have one. How anyone found us I don’t know, but they did. In fact an amazing 32 boats found us!! More and more boats appeared out of the mist like ghosts and each checked in and tried to stay within sight of the committee boat, so it got pretty crowded at one point. 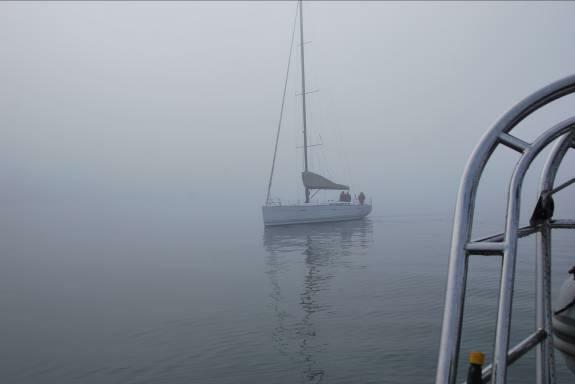 Visibility was 50 meters at best and fog horns were going off all around us. “Traffic” was constantly talking to deep sea ships as they made their way to the inner harbour under the bridge, and it was BUSY out there. At 10.55 we put the “AP” flag up and delayed the race, then Andreas went below to prepare lunch for us all. There were 10 of us aboard so it was quite a load, but 3 of them were students in the journalism program at UBC. What a shame for them that they could not use much footage, but at least they had a good time at the last race, so will use that footage for their project on winter sailing. A huge raft started to form about 75 meters away. Was the fog lifting? The wind was a constant zero on the instruments, then climbed to 1.8 knots and back to zero. We were not going anywhere even if the fog did lift. Then the surface of the water stirred and we saw nearly 7 knots and yes, there was Siwash Rock – or was it? 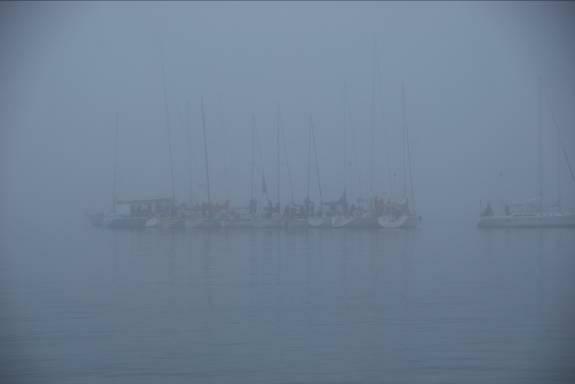 But too little too late, the wind died again and the fog came down and we cancelled the race at 12.30. Then we spotted some spinnakers being hoisted and sails being unfurled and people were playing out there! It would have been nice, but there was no way we could have set a course. Ships and other traffic were out there and even if they do have radar they would probably not see the fleet. It was too dangerous and unpredictable to have a successful race this afternoon, so we finished lunch and headed home to the VRC and the cozy confines of the pub. People were getting chilled out there, even though the temperature was probably 7 degrees C, it was time to warm up. There is certainly something to be said for a good heater on your boat in weather like this. One record was broken this day however, and that was the size of the raft. The previous record on a race day was 11, this day we had 13 boats lashed together cluttering up English Bay!! And I have no doubt that a great time was had by all. If the law of averages can be believed, the next race on February 9th will be a great one with gorgeous 12 knot breezes and the sun will be out, spring will be in the air and all will be well. Gird your loins people! Happy New Year! The 2019 VRC Racing Calendar Is Here!